Osteopetrosis is a bone disease that causes bones to be too dense, leading to easily broken bones. Osteopetrosis causes special bone cells called osteoclasts to function abnormally. Normally, osteoclasts break down old bone tissue as new bone tissue grows. For people with osteopetrosis, the osteoclasts do not break down the old bone tissue. This bone build up causes the bones to overgrow. In the head and spine, this overgrowth puts pressure on nerves and causes neurological problems. In the bones where bone marrow usually forms, the overgrowth crowds out the bone marrow. There are several types of osteopetrosis: autosomal dominant osteopetrosis, autosomal recessive osteopetrosis, and intermediate autosomal osteopetrosis. Which type you have and the severity of the condition depends on how it was inherited. Originally called Albers-Schonberg disease after the German radiologist who first described it, this form of osteopetrosis is mild and is usually found in adults between 20 and 40 years old. Adults with osteopetrosis have frequent bone fractures that don’t heal well. Bone infections (osteomyelitis), pain, degenerative arthritis, and headaches may also occur. ADO is a mild form of osteopetrosis. Some people may not have any noticeable symptoms. ADO is the most common form of osteopetrosis. Approximately 1 in 20,000 people have this form of the condition. People with ADO only inherit one copy of the gene, meaning it came from only one parent (known as autosomal dominant inheritance). Those diagnosed with osteopetrosis have a 50 percent chance of passing the condition on to their children. ARO, also known as malignant infantile osteopetrosis, is a severe form of osteopetrosis. ARO begins to affect the baby before he or she is even born. Infants with ARO have extremely brittle bones (the consistency of which has been compared to sticks of chalk) which break easily. During the birth process, the baby’s shoulder bones may break. This form of osteopetrosis is rare, affecting 1 in 250,000 people. The condition occurs when both parents have an abnormal gene that is passed to the child (called autosomal recessive inheritance). 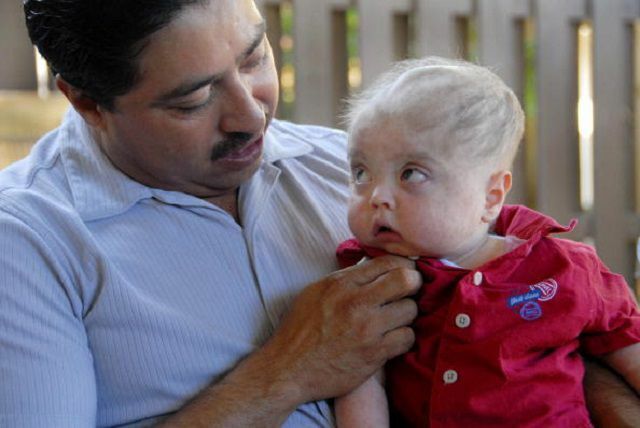 The parents do not have the disorder, even though they carry the gene. Each child they have has a 1 in 4 chance of being born with ARO. Left untreated, the average lifespan for children with ARO is less than ten years. Intermediate autosomal osteopetrosis is another rare form of osteopetrosis. Only a few cases of the condition have been reported. IAO can be inherited from one or both parents, and typically becomes apparent during childhood. Children with IAO may have an increased risk of bone fracture, as well as anemia. Children with IAO typically do not have the life-threatening bone marrow abnormalities that children with ARO have. However, some children may develop abnormal calcium deposits in their brain, leading to intellectual disabilities. The condition is also linked to renal tubular acidosis, a type of kidney disease. In extremely rare cases, osteopetrosis can be inherited through the X chromosome. This is known as OL-EDA-ID, an abbreviation of the symptoms the condition causes — osteopetrosis, lymphedema (abnormal swelling), anhidrotic ectodermal dysplasia (a condition affecting the skin, hair, teeth, and sweat glands), and immunodeficiency. People with OL-EDA-ID are prone to severe, recurrent infections. Both the adult and childhood forms of osteopetrosis may benefit from Actimmune injections. Actimmune (interferon gamma-1b) delays the progression of malignant infantile osteopetrosis because it causes an increase in bone resorption (breakdown of old bone tissue) and in red blood cell production. A bone marrow transplant is the only complete cure available for malignant infantile osteopetrosis. Bone marrow transplant has many risks, but the benefits — avoiding childhood fatalities — can outweigh the risks. Other treatments include nutrition, prednisone (helps improve the blood cell count), and physical and occupational therapy.